We offer training so that participants can achieve a Certificate of Advanced Studies in the field of Forensic Imaging & Virtopsy. The title is then issued by the University of Zurich. 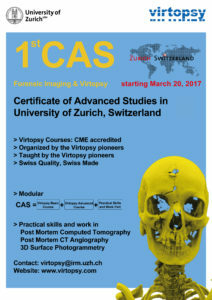 The CAS in Forensic Imaging & Virtopsy of the University of Zürich, Switzerland, currently is the only public University degree in Forensic Imaging & Virtopsy that is offered for non-profit. Forensic Imaging & Virtopsy contains the subject field of Virtopsy, that is, medicolegal imaging methods, including postmortem computed tomography (PMCT), but also covering post mortem angiography, post mortem magnetic resonance imaging (PMMRI), methods for photographic and geometric 3D surface capturing and Virtopsy aspects of clinical forensic medicine. The last decade has seen an unprecedented increase in adoption of these techniques in the field of forensic pathology. Also, clinical forensic medicine increasingly bases expert opinions also on clinical imaging data and their interpretation. With that, the content provides relevant up-to-date training for forensic radiology / forensic radiologists, for forensic pathology / forensic pathologists and for experts in associated fields. The course director and organizers are members of the International Society of Forensic Radiology and Imaging (ISFRI). The ISFRI also works towards coordination across best practices, education, research, quality standards, certification as well as providing a journal for the members of the society, the Journal of Forensic Radiology and Imaging. 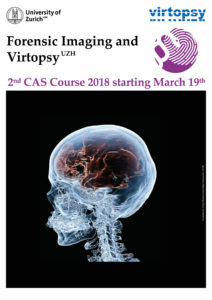 Details are outlined in Regulations Governing the Continuing Education Program CAS in Forensic Imaging and Virtopsy at the Faculty of Medicine, University of Zurich, Switzerland [pdf]. The Institute of Forensic Medicine of the University of Zurich offers as a postgraduate forensic University degree the CAS (Certificate of Advanced Studies) in Forensic Imaging and Virtopsy. The total days of actual presence required at our institutes is 5 days (for modules I and II formerly called Virtopsy Course, which is an integral part of the CAS, or a requirement) and roughly another 5 days for further course work (module III). In addition, a case book that the participants will prepare off-site (for example, at their own work place) has to be submitted to the CAS course coordinator. It is suggested to provide and contain 50 (fifty) single case studies from the own case load of participants. Deadline to submit the casebooks are given below. The CAS provides theoretical knowledge of forensic imaging, notably surface scanning and 3D-photogrammetry, post-mortem CT and MR, post-mortem angiography, robot-guided biopsy, and clinical forensic imaging. Practical skills are taught in post mortem CT reading and report preparation, post mortem CT angiography and 3D surface documentation. While PMCT and PMCTA are widely published scanning methods, we are convinced that there is a particular approach to this to make it work for daily forensic casework. To help course participants to get the necessary traction, we therefore identified thorough PMCT reading, effective comprehensive written and graphical reporting, practically performing a PMCTA (post mortem CT angiography), and being able to practically perform 3D photogrammetry as key content. Participants will be guided and taught through a set of cases and findings. They will learn and perform image reports both written and graphical. And there will be a practical PMCTA workshop with a newly developed very affordable PMCTA kit that contains all necessary materials for anyone to perform a PMCTA. Every participant will be equipped with such a kit. Students of the CAS Virtopsy are expected to have a Master’s degree in medicine from an accredited university and certification as a specialist in forensic medicine or radiology. In exceptional cases, persons with a Bachelor’s degree in a medical field from an accredited university and several years of work experience in radiology, or persons with an equivalent qualification may be admitted to the program. You may feel overwhelmed with this course, as it requires significantly more than the modules I and II of the CAS Forensic Imaging & Virtopsy. Proficient use of computer (mouse, keyboard; Word, Powerpoint) as using software is a predominant substrate in imaging generally and in post mortem imaging specifically. English language skills that are sufficient to both understand others and express oneself both orally and in writing in an international setting. The CAS in Forensic Imaging and Virtopsy contains three modules. The first two modules are the classical Virtopsy Courses Basic and Avanced. They convey theory and a small amount of practical workshop work with case data. We now expanded the choice of courses towards the completion of a university CAS title. For that, the Virtopsy Practical Course (plus Casebook) was created to fill needs for many participants in relevant aspects of forensic post mortem imaging. The Virtopsy Pre-Course is a facultative module that allows participants to increase their software use proficiency. We created this as a service to participants that are not too fluent in using CT viewing software and that would like to improve their software use skills. It therefore is not a part of what the University of Zurich considers to be part of the actual forensic imaging certificate course. After all, there are plenty of course participants that are well versed in using CT viewing software and in no need of extra training. We regularly apply for EACCME accreditation. Depending on the specific time schedule of the course, each course part (pre-course, as well as CAS-modules 1,2,3) is awarded a number of CME points. In 2019, the pre-course was awarded with 6 CME points, module I was granted 13 CME credits, module II was granted 19 CME credits and for module III, 28 CME points were granted. We also apply for ISFRI accreditation. In 2019, we received preliminary information that a 2018 application was approved. The course flyer with an overview of the program is here. The detailed program and curriculum will be distributed to CAS participants directly. For more information contact contact virtopsy@irm.uzh.ch. The CAS for Forensic Imaging and Virtopsy requires you to prepare a casebook containing 50 case studies. Based on both our own case based experience and scientific studies into the effect of written and depicted reporting, we are convinced that PMCT evidence needs to be presented carefully to the attorneys or authorities that authorize you to perform a forensic PMCT on a body. The suggestions we make for your casebook base on our experience and insights. Preparing the CAS Forensic Imaging and Virtopsy casebook may allow you to practice the preparation of PMCT evidence in a way that also authorities and courts can follow your descriptions. While we teach and mostly use straightforward tools (such as Microsoft Word and Powerpoint) to generate our written and visual reports, reports can have many forms. Some are quick and dirty, where visually messy output is made by sloppily designed procedures, some are exhausting to achieve and perfected in their appearance. The true art, however, consists in achieving perfect appearances very fast. The system that allows the user to use less mouse clicks, less key presses and less time to provide a better layout, and more thoroughly grammar checked text, will win. The manually optimized solution are commercial text- and image layout processing products; one stands on the shoulders of giants there: their optimization has been approximated through many, many software revisions (as examples, Microsoft Word has seen revision changes since 1983, that is, for around 35 years; Microsoft Powerpoint has been repeatedly revised since 1987, that is over 30 years, so in terms of pure manipulation efficiency, these are a hard act to follow). However, parameter driven report generation may be interesting as an alternative, where one may work towards fully scripted, variable and ultimately database driven report designs, where text, images and captions obtain a perfected print layout without manual interference with the actual nudging, placement or alignment steps that often are so time consuming. When using LaTeX possibly as middleware, the quality of the typesetting and postscript layout can be maximized in such a way – also because LaTeX has been repeatedly revised and improved since 1985, that is, 33 years. Whatever the concise solution one choses, the principles of forensic PMCT reporting remain the same – the client will require all relevant information, in an understandable and concise but not too abbreviated fashion. Modules I, II and III: All compulsory modules together: CHF 8’000.-, including registration, exam fees and course material; excluding travel and accommodation costs. Pre-course: Facultative software / 3D visualisation module : CHF 300.-, including registration, exam fees and course material for participants of module 1 (or, 1 and 2, or, 1 and 2 and 3); cost of the Virtopsy Pre-Course is CHF 650 for participants that do not participate in any CAS Forensic Imaging and Virtopsy course modules. Prof. Dr. med. Michael Thali, Exec MBA, Director of the Institute of Forensic Medicine at the University of Zurich. Dr. med. Wolf Schweitzer, Forensic pathologist at the Institute of Forensic Medicine at the University of Zurich. For information and flyer please click here. Virtopsy Basic Course (module I): March 16-17, 2020. Virtopsy Advanced Course (module II): March 18-20, 2020. Virtopsy Practical Course (module III): March 21-26, 2020. Virtopsy Pre-Course (not a module): March 12, 2021. Virtopsy Basic Course (module I): March 15-16, 2021. Virtopsy Advanced Course (module II): March 17-19, 2021. Virtopsy Practical Course (module III): March 20-25, 2021. 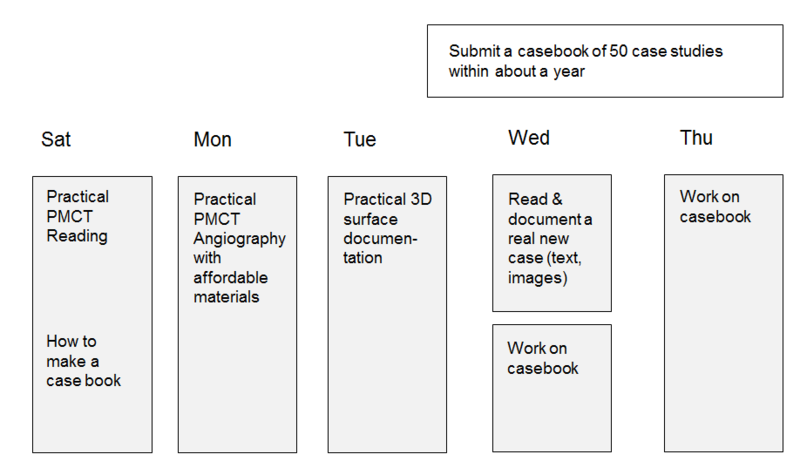 Deadlines for casebook submission I: 30th June 2017, II: 31st December 2017; III: 30th March 2018, IV: 30th June 2019.